I my young days a lot of men had one of these in his pocket. This one came from James Flett & Sons (Orkney) Ltd., in the early 60s. I think it cost me 12 shillings and 6 pence. It still closes with a lovely "snick". My father still carries one. The blade is worn to a quarter of it's original size. Must be 40 years old. Ian your father must be a remarkable man lucky if I dont loose a knife after 40 days!!. A very good school pal of mine back here recently took out a peedie pen knife fae her hand bag and said do you mind giving me that knife John,no I said well she says you gave it tae me when we were bairns as I had thought it strange she did not have a knife. Anna will not want tae see this as I doot that wid be a bit more 40 years ago!!. Great gullie! In the 50's every emergent school lad had them, to be flourished instantly if string needed cutting, or gutter scraped off the arse of somebodys breeks from a fall. They were much fancied and entirely superior to any Roy Rogers affair which small boys carried! That is super Ian. The blade is carbon steel so takes a good edge. Of ourse it also can get rusty if neglected. My Coldfinger was lost for many years so was not sharpened much. It is a great pity that it is now illegal for me to have it in my pocket. No Sandy, it is not illegal to carry it in your pocket as long as the blade is under 3" long and the knife is not a Lock Knife (which the "Cold Finger" is not), I own several "Cold Finger" knives and carry one all the time. The main participants in this little tale are now all dead. But if the pocket-knife pincher has gained admittance to the hereafter I hope his ears are burning. One day at school when somebody's pencil needed sharpening, and the sharpener installed on the teacher's desk was found to be u/s, the teacher had me sharpen that pencil, and two or three others while I was at it, over the waste-basket in front of the class. Hard to imagine a teacher asking an 8-yr-old to do that today. Remember John that Anna has a special birthday this week. You also tried to give a few accordion lessons to me and Kathleen after primary school in the afternoon, she picked it up well but the less said about my attempt the better! I have me Dads 'cold finger', it still takes a good edge too, he was never without it in his pocket, like lots of guys his age then. I was looking at the www for cold finger knives and landed on Sandy Windwick's photo of one. I have had two or three since before leaving Kirkwall School in 1956. The first one got as far as South Island New Zealand and back when I was doing my National Service in the Navy. The first one cost 5/- from Nicol Spence and I can't remember its fate but I bought a second one for 7/6 and used it for years until it fell out of my pocket in either Tesco's underground car park here in Scarborough or in the car park of a local garden centre. Fortunately I had bought a spare (over £3 by then) when we were up on holiday one year and it is still going strong today. I also found a video of one being hand made and there was nothing sophisticated about the man's workshop. We were looking for information on cold finger knives after Charlie opened the letters with his one. 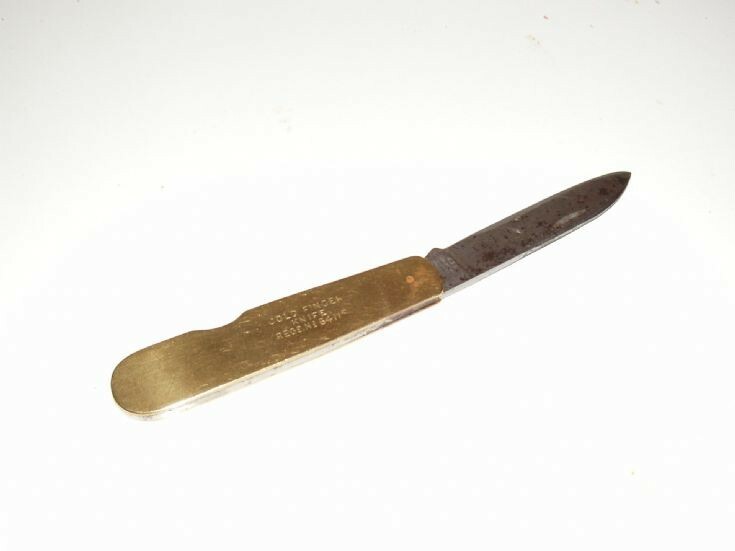 It belonged to his grandfather and was found in a drawer with other pen knives. It is used daily on the farm. My cold finger is never far from me. So glad to see others are as taken with them as I am. Mine is 40+yrs old and still going strong. I have a Cold Finger Knife REGd No 64115 (I think) but it says" DRP Made in Germany" on the base of the small blade? I have a cold finger knife as the one in the picture.I previously had a two blade version but lost it. I rang a hardware store in Kirkwall to buy my replacement. The guy said right enough you'll want the key shop next door. I'll go and get him. I sent him £10 and he posted the knife with the change sellotaped to the package - wish they would reintroduce them, there would be a decent market. I have a cold finger double knife reg no 64115. Any more info greatly appreciated. I have a Lockwood brothers brass 2 bladeblade pocket knife 6411s/5 c+x on blades as I need a selling price?thankyou.darren. I have one I bought in Lerwick many years ago can't remember were I bought it I also have my Grandfathers one both have had a lot of use but still take a good edge .